I didn’t sign up in time for the Shamrock 5k so I decided to create my own Birthday 5K … it was also my first solo run in Central Park. In which I ended on the west side in the 70s. I took the bus back over and ended up making it way longer process – but made it home in time shower & head out for birthday brunch! 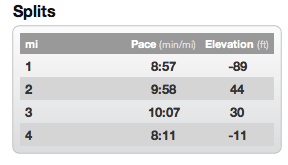 It was not an easy run & a reminder that not every run or race will be a PR. Categories: Uncategorized | Tags: 1/2 marathon training, 5K, birthday fun, birthday weekend, race | Permalink.